if you need dual redundant system we have 2 matching units both new tubes installed we also have single/redundant controller tandem baseball WG switch with dummy-load etc. if you need dual redundant system we have 2 matching units both with new tubes installed we also have single/redundant controllers, tandem baseball WG switch, with dummy-loads tc... We have other uplink equipment please look in to our other ebay uplink encoder antenna listings for more HPAs, SSPAs, Upconverters, Encoders , Antennas and complete Uplink trucks call us +16109052510 ( WhatsApp number) for more technical info. Thanks for looking. Local pickup and testing is available. New Tube installed by the Factory. Mint Condition, same as new. 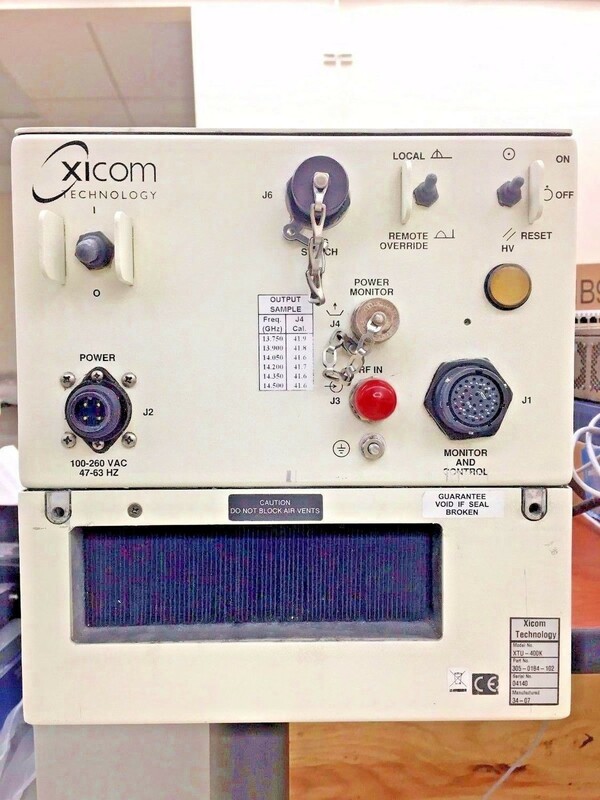 The Xicom XTU-400 is a compact self contained antenna mountable power amplifier with built-in block upconverter designed for low cost installation and long life. RS-232/422/485 InterfaceThe XTU-400 design eliminates the need for an amplifier shelter as well as a long waveguide run between the amplifier and the antenna feed horn. For example, an antenna mount 400 Watt Ku-Band amplifier with its shorter waveguide run will often deliver EIRP comparable to a 600 Watt rack mount HPA. RF filters, cooling, and monitoring & control systems are all self contained within the HPA. These features provide high reliability, low maintenance costs, and low replacement costs. The XTU-400 uses high efficiency dual-stage collector Traveling Wave Tubes (TWT). Some benefits of this type of TWT are: reduced prime power consumption, lower internal operating temperatures, and reliability enhancement. These benefits are obtained for both the linear and saturated modes of operation. The unit incorporates an L-Band block Upconverter, thereby eliminating the need for a separate outdoor unit (ODU). The L-Band transmit signal and a 10 MHz reference signal are brought out to the unit on a single coax line. The XTU-400 may be configured for single thread, redundant, phase-combined, to linearized operation. A remote external controller is available to operate the HPA from a user selected locations. Mounting brackets can be supplied to mount the HPA to most popular antennas.Only ONE UNIT COMES for this price. The XTU-400 may be configured for single thread, redundant, phase-combined, to linearized operation. A remote external controller is available to operate the HPA from a user selected locations. Mounting brackets can be supplied to mount the HPA to most popular antennas.